Are you receiving This Week in Tectoria in your inbox??? Every Friday we send out a sizzling update about what’s going on in Tectoria: Canada’s hottest technology region. 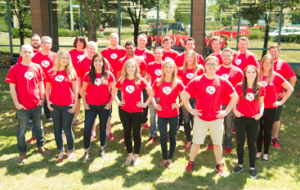 Learn about people making a difference in our tech scene, as well as events and activities that can help you connect with your fellow Tectorians and your community. Sign up now and get a newsletter in your email inbox once a week! Our Tectorian of the Week is: RingPartner! RingPartner was one of the first companies to sign up for the VIATEC Food Bank Challenge, in support of the Mustard Seed Food Bank. Last year, their founder, Todd Dunlop, shaved his head in support of the cause… so it’s no surprise they’re kicking things off on day 1 of the challenge! Today from 3pm to 6pm they’re hosting an Open House and Silent Auction at 775 Topaz Ave. You can bid on items such as gift certificates from Salt & Pepper Fox, Healthy Beet Nutrition (Consultation), She She Bags (Matt & Nat! ), Lighthouse Beer and more. All proceeds go towards the VIATEC Food Bank Challenge. Swing by if you can! if you’d like more info on the challenge or want to donate online, click here. RingPartner makes it easier than ever to harness the power of a simple phone call to grow your business. Because RingPartner operates on a Pay Per Call basis, clients only ever pay for calls delivered to them in real-time. In 2015 RingPartner was selected for the Google Patent Starter Program, and was awarded two patents. As part of this program, RingPartner also joined the LOT Network, which helps protect companies large and small from patent trolls. Our Tectorian of the Week is: Quakey Victoria! 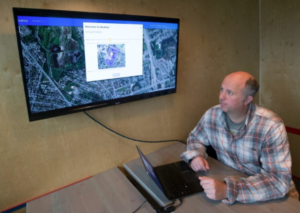 VIATEC Member, Foundry Spatial, just released an online tool called Quakey Victoria, which allows home and business owners to generate earthquake hazard reports for their property based on public data. This launch is timely seeing as the annual province-wide earthquake drill just took place yesterday, which saw thousands of students, workers and families stop, drop and cover as part of the ShakeOut B.C. campaign. The online tool allows clients to type in an address and get a 20-page report detailing the risk of the ground underneath. This includes the risks of ground motion, amplification and liquefaction, as well as slope information and tsunami risk. The report also offers tips on how to prepare for the one-in-three probability of a major earthquake in the next 50 years. 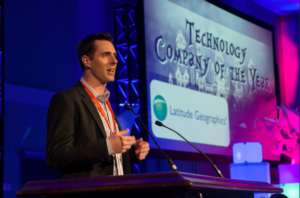 Our Tectorian of the Week is: Latitude Geographics! Battery Ventures, a global technology-focused investment firm, announced on Tuesday that it has made a significant investment in Victoria-based Latitude Geographics! Specific terms of the deal were not disclosed. Latitude develops software called Geocortex that helps customers maximize the potential of their investment in web mapping technology made by Esri, the world leader in GIS whose software is the most powerful mapping and spatial data analytics technology available. Latitude’s business centers on government customers, as well as industry sectors like energy and public safety, and is focused on making it as easy as possible for organizations to deliver mapping and GIS technology to their end users. The company was founded in 1999. Congratulations to the entire Latitude team! Our Tectorian of the Week is: Certn! You may remember them from earning TotW just this past May. Certn is a platform that uses data points from thousands of sources to not only look at the past, but for the first time, leverages data science to predict the future. Using machine learning and AI, Certn creates the most comprehensive and predictive applicant profiles on the planet. This allows our customers to effectively validate identity, and make better risk decisions while satisfying KYC and AML requirements. Certn was just announced as a Top 10 finalist for the BCIC-New Ventures Competition, moving on to the 4th and final round! The 10 finalists represent the best in emerging BC tech. Winners will be announced on September 25th. Good luck to you, Certn! Our Tectorian of the Week is: SportstoNews! Local tech company, SendtoNews (STN), just launched SportstoNews.com, a full service sports page hosting service, giving publishers a rich and engaging golf news site, entirely automated, curated and monetized by STN. 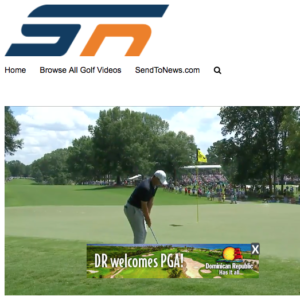 SportstoNews.com provides publishers with a dedicated golf vertical site that is customized to their own site’s look and feel and is constantly updated with the latest content from STN’s video library as well as editorial articles. The page is made available free of charge to the publisher with their domain placed in the URL. STN monetizes the sites with a share going to the linking publisher. This is an incredible addition to STN’s already impressive portfolio and we congratulate them on this accomplishment! Click here to read the full press release. 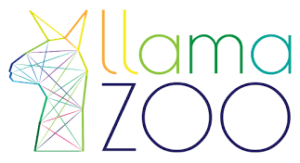 Our Tectorian of the Week is: LlamaZOO Interactive! Mine Life VR: Developed for Teck Resources, allows for stakeholders to visualize the 50 years of mine planning data which goes into an open pit mine. 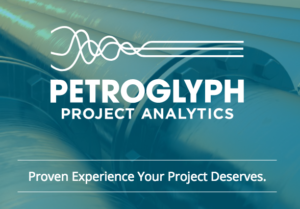 Our Tectorian of the Week is: Petroglyph Project Analytics! Petroglyph Project Analytics (PPA), is the authorized distributor across the Americas of Trimble Civil Engineering solutions, including TILOS, a world class linear infrastructure scheduling software. TILOS is used by global leaders in linear infrastructure construction projects such as roads, rail, tunnels, power distribution and pipelines. That’s a whole lot of great news! Congratulations to Petroglyph! 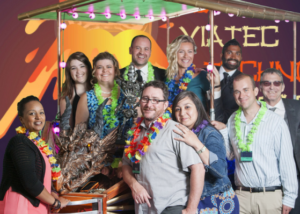 Our Tectorians of the Week are: The 2017 VIATEC Awards Winners! On June 2nd, 813 members of the tech community gathered to celebrate their incredible accomplishments through the most elaborate tech awards in BC. 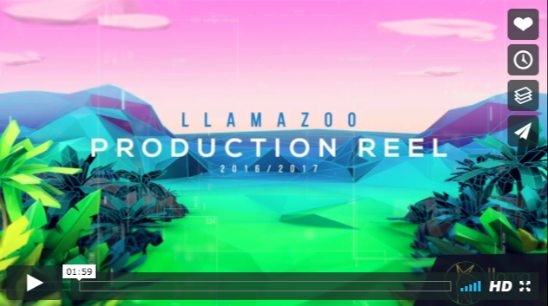 Check out the awesome video recap right here. Congratulations to the following Recipients! 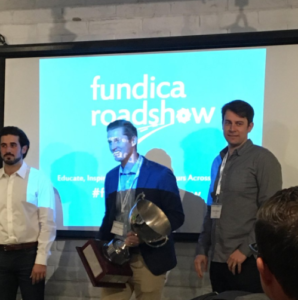 The startup that came out on top was Certn! So why not make them our Tectorian of the Week?! Certn was founded with one goal in mind: build a platform that enhances how we evaluate credibility today to help promote financial inclusion while reducing risk for financial institutions, landlords and employers. It’s the new standard in risk management solutions: it accurately predicts customer behaviour to virtually eliminate risk from credit & property portfolios. Certn is also a member of VIATEC and currently in the VAP (Venture Acceleration Program). Our Tectorian of the Week is: Nobilified / Politikats! Local entrepreneur, Chris Jensen, runs Nobilified which is an online business that allows you to: send in a photo of yourself, your spouse, an employee or your dog, and have the face painted onto a period piece of art. It could be Napoleon, Catherine the Great, Joan of Arc or the Prince of Wales! 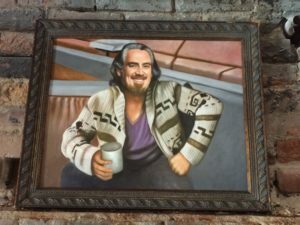 VIATEC CEO, Dan Gunn, even has one of him portrayed as “The Dude”. Well, this week Chris made the news with his new business, Politikats. Yup, he’s built cat scratch posts with politician’s heads on top of them. And cat lovers are eating them up. He sells scratch posts of Barack Obama, Hillary Clinton, Israeli prime minister Benjamin Netanyahu, Russian president Vladimir Putin, Donald Trump and Bernie Sanders (which sold out). Christy Clark you ask? Well, there’s only ONE of those and he’s auctioning it on May 8, the day before the provincial election, to raise money to support an initiative to boost grassroots entrepreneurship among First Nations youth aged 13 to 19 on Vancouver Island. 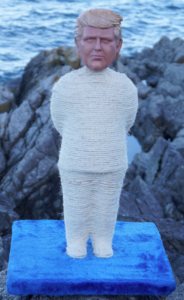 The Christy Clark piece took 140 hours to create with a combo of hand making and 3D printing. We’re very excited for Chris Jensen’s road ahead and we rooting for him in Tectoria!